‘Tis the season for fear and fright, and what better way to give yourself the shivers than by getting out to one of Manitoba’s many Halloween haunts. From haunted forests for the adults (Six Pines) to ghostly tours for the kids (Marine Museum), there’s something bone-tinging for everyone this October. Characters from all walks of life, planets, and dimensions gather at the C4 Central Canada Comic Con. Fans and hobbyists can browse the artist alley and the exhibitor hall, all before getting the chance to meet special guests such as William Shatner (Star Trek), Mark Pelegrino (LOST, Supernatural) and Tia Carrere (Wayne’s World, Relic Hunter). Where else can you see Sailor Moon, Inuyasha and Daenerys Targaryen all in one room? What better way to celebrate Halloween than with blood-thirsty ballet? The classic tale of Dracula returns to the Royal Winnipeg Ballet for the 77th season opener. Dress up in your favourite Halloween costume and be entered to win a walk-on roll in RWB’s Nutcracker, and two tickets into the show. Adapted from the novel by Chaim Potok, My Name is Asher Lev follows the story of a Hasidic Jewish boy in New York City who grew up with the itch to draw and create art; a passion not necessarily supported by his traditional family and community. Follow along on Asher Lev’s journey as he navigates between tradition, belief and his own passion for life and art. Get pulled into this family drama that follows Bernice Trimble and her three adult children as they struggle to cope with the life-changing news of Bernice’s diagnosis. While Iris, the middle daughter, turns to making her mother’s famous casserole, the other siblings take different routes on coping – all of which play out in the kitchen. Hiking in Manitoba means you never need to worry about altitude sickness. But that’s not to say the province’s broad, sweeping canvas is bland. Ma Nature painted in tall wild grass prairie, rolling, forested hills, undulating river valleys, vast wetlands and the occasional view-encompassing escarpment. For even more variety, she sketched in innumerable lakes and rivers dotted with granite and limestone outcroppings, set among deep deciduous and evergreen forests. And guess what? Fall happens to be one of the best times to embark on a hike. Be inspired by the story of a boy who defies the odds and realizes his dreams in Billy Elliot the Musical. Featuring music by Elton John and incredible dance sequences, you will be dazzled by Billy, a young boy in UK destined to follow his father and brother to work in the coal mines until he discovers the exciting world in ballet. If you haven’t spent a day at The Forks in awhile, you should probably make a date with this historic site ASAP. The market retains the nostalgic feel that you likely remember – with live street vendor music serenading the halls and plenty of knickknacks to discover – while introducing a gorgeous new dining hall and new food vendors to indulge in. You will, as they say, go for the food and stay for the beer. 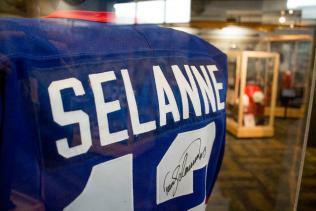 Celebrate an era that will bring you back to the old Winnipeg arena and into the thriving MTS Centre with treasures and memorabilia from our hockey history. Take a journey with the Winnipeg Warriors of the late 50’s through to the WHA Jets in the 70’s, and all the way to Jets 1.0, Manitoba Moose, and the present day NHL Jets 2.0. 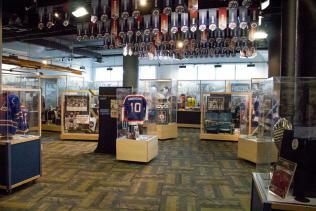 The fabulous exhibit is present by the Winnipeg Jets Hockey Club.